Make sure that your lawn mower, tools or other items are well protected from the bad weather and no longer cluttering up the house or garden, with the incredible, 4’8 x 3’2 Windsor Overlap Mower Store. 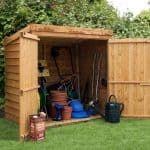 Offering you a very low cost way to protect the things you need to keep your garden in great condition, this shed is the ideal way to give you that extra storage space you require and also look good doing so. 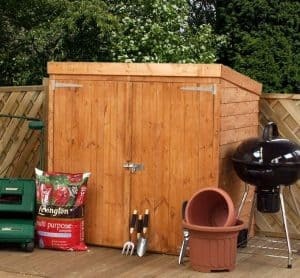 This is a very classic looking type of shed and it will fit in any style of garden and not require a whole of space. Those huge double doors will make getting things out and then tidying them away again very easy and hassle free. 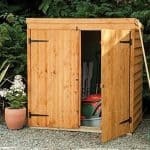 This is a great shed that offers lots of storage space, but at a very reasonable price. Even though this is a shed which is very affordable, it is built to the same high standards Windsor always use. Top of the line overlap cladding and a felt covered pent roof are there to stand up and fight off the rain and snow from getting inside. The floor is made with 8 mm thick boards and then supported with pressure treated floor joists so that you can store very heavy items inside. For you people who love to take good care of your garden here we have a wonderful little shed that will be able to keep your mower tidied away and protected from the rain and also be able to store a whole bunch of other gardening items or tools. 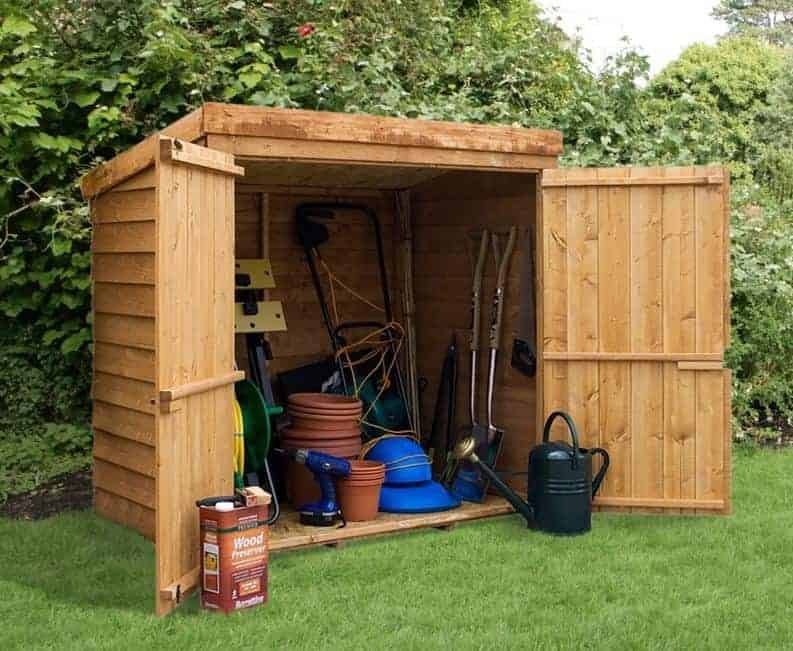 Even if you are not a gardener then the 4’8 x 3’2 Windsor Overlap Mower Store would make for a great and low cost way to add some extra storage space to your garden to help keep the clutter to a minimum. Even though this does not take up a lot of space in the garden, you still have a lot of space to make use of inside. The width of the shed is 4 feet 8 inches and the depth is 3 feet 1 inch. The height at the front of the shed is 4 feet 8 and then at the back it is 4 feet 2. So as you can see there is some very nice storage space here. We love a pent style roof as it does just such a great job at keeping the rain out. This pent roof is made with some 8 mm boards that are covered with durable and long lasting roofing felt. The roof will do an amazing job in protecting what you have from the rain and as a great added bonus it looks good doing so. To really make sure that the rain stays out Windsor have used overlap cladding. We absolutely adore overlap cladding as it really does look great, but it is one of the best styles of cladding for stopping the rain from ruining your stuff. The cladding is a solid 7 mm thick and we honestly feel that this is more than enough to protect what you have inside. It is almost like Windsor knew when they were designing this shed that it would be taking a little bit of a beating every now and again as people put things in and take them out. That is why they have used a very sturdy, 28 x 28 frame so that it will be able to take the odd bang with a mower as you get it out or hit with a shovel as you throw it back in. The flooring is almost a mirror image of the roof as it is made with the exact same 8 mm thick boards. These are very solid boards that thanks to the pressure treated floor joists underneath them will be able to take a lot of weight. Even if you have a very heavy duty lawn mower the floor will be able to handle its weight. The shed will be given a basecoat treatment and this is fine for the short term, but as soon as possible you will want to give it a good coating of wood treatment. We would say that you are best doing this near enough as soon as you have built it and then once a year thereafter. Even though this is a low cost shed it still comes with an impressive ten year anti rot guarantee. This guarantee to be valid does require you to coat the shed in wood treatment, but as this is something you really should be doing anyway this is not a big deal at all. We were very impressed with the huge double doors on the 4’8 x 3’2 Windsor Overlap Mower Store these are very large and when open give you an immense amount of room to get things in and out. 3 feet 11 inches is the width and 4 feet 2 inches is the height. We do not see you having any issues getting your lawn mower in and out of here. Those wrestling matches you had with your single door, small shed to get the mower out will be a thing of the past. There are no windows on the shed, but this is all about keeping your belongings safe so we have no complaints over the lack of windows. You get a lot of security with this shed. As standard it comes with a pad bolt which keeps those doors tightly shut. It is very easy and cheap to add a padlock if you want to make it even more secure and so that it is locked up tight at night. When the doors are closed this shed offers no way for people to see inside so you get 100 percent privacy. If you want to customise the shed we feel that you should do this via the wood treatment. This way you can give the shed the protection that it requires, but also put your own little stamp on it by picking the colour. This is a very low priced shed and a huge plus of it is that the only extra required would be a padlock which you can get for a pound. For this kind of the price the quality of this shed is just amazing. We were very impressed with how well made this shed was and think that for the price it honestly offers amazing high quality in every regard. All the shed asks from you is a yearly coating of wood treatment and then it will stand strong for many years. The materials used here have been chosen because of how long lasting they are. Clearly this is not the largest shed in the world, but it still offers a very decent amount of storage space. We feel that if you are very smart about the way you organise it and perhaps even add a shelf or two then you will have all the storage space you could possibly need. A big plus of a shed this size is that it really is not all that big of a job to put together. You and a friend if you follow the instructions should be able to have this up in a few hours. This is one of the best, low priced sheds that we have seen in a long time and feel that it does offer you a great way to add storage space, but without a high price tag. Final Thoughts: If you want to keep your mower and other tools or gardening gear safe from the rain, but do not have a huge amount of spare space or even a big budget, then the 4'8 x 3'2 Windsor Overlap Mower Store would be just perfect for you in every way. You are getting a very high quality and well designed shed that is going to last you for lots of years and keep everything that you store inside safe and sound. 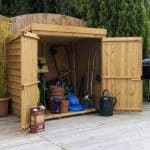 The storage space and the fact it is very well priced is fantastic, but this is actually a very nice looking shed that will fit right in and do an amazing job looking after your items. And it does it all at just over £150.